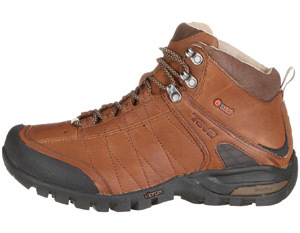 Is The Teva Riva eVent Hiking Boot A Great Choice For The Coming Winter? On the surface, the Teva Men’s Riva Leather Mid eVent Hiking Boot looks like your standard, lace-up leather walking boot, with little more than some subtle detailing to give away the brand. However, underneath this ordinary-looking exterior there are some key features and materials including the rubber sole, eVent waterproof membrane, shoc Pad heel cushioning and mush infused insole.